Photo source: Ninara on Flickr. Some rights reserved. The Qashqa'i (pronounced KASH-kai) are a nomadic people who roam across the harsh deserts of southwest Iran. 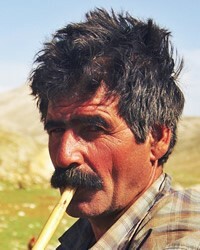 Although they are made up of many different linguistic, cultural, and tribal origins, they all call themselves "Turks." Qashqai Turki, their spoken language, does not yet exist in written form; most of them communicate in the Farsi language instead. We know very little about their history, except that the Qashqa'i left central Asia in the 11th century AD and began entering Iran. Nothing else is recorded about them until the mid-18th century when the ruler of southern Iran appointed a Qashqa'i as the tribal leader of a province. The Qashqa'i are considered a minority people group in Iran. Forceful attempts have been made to incorporate them into the mainstream of Iranian society; however, such efforts have failed, and these fascinating people have remained independent and proud. Although the Qashqa'i are professing Muslims, they have little use for organized religion beyond political purposes. In the Qashqa'i society, the upper class consists of men who are politically active. Their wealth comes mainly from control over land and ownership of herds. The lower class is made up of those who hire out their labor. They may serve as full-time shepherds and camel drivers, or as part-time field laborers and sharecroppers. The poorest of the Qashqa'i are those people who own no land or herds. They are not paid money for their goods or services, but are paid in food, clothing, supplies, and/or animals. Within this "poor class," anyone over the age of eight years is expected to work to support himself. Although the Qashqa'i women have little freedom, they do take the lead in certain family matters. For example, they are responsible for arranging marriages. They are probably best known, though, for their expert weaving skills. The main foods for Iranians are rice and bread. Traditional dishes include abgusht (a thick meat and bean soup), dolmeh (vegetables stuffed with meat and rice), and kebob (lamb roasted on a skewer). The fact that the Qashqa'i are travelers seems to add to their military, political, and cultural identity. In fact, the Qashqa'i who settle are seen by others within their group as people who lack an interest in political matters. Islam is the state religion of Iran, and virtually all of the Qashqa'i profess to be Muslims. In reality, however, they have very little contact with Islamic institutions or devout Muslims; they simply use Islam for its political advantages. Very few observe daily prayers, and they do not fast during Ramadan (the ninth month of the Muslim calendar in which all Muslims are expected to fast and pray). They do, however, follow Muslim traditions during the rites of marriage and death. 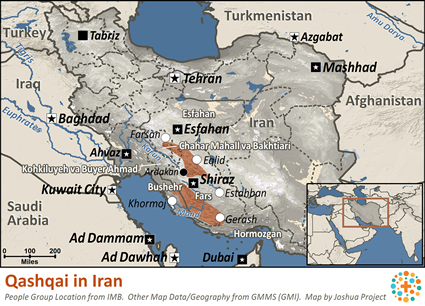 Iran today faces serious economic and political problems. To survive the political order, they must side with certain leaders, such as Muslim clergy, who they feel can help protect them from demanding state institutions and rulers. The Qashqa'i live in a constant state of political unrest, and there is a tremendous need for true, inner peace. Many children do not attend school due to the lack of classrooms and teachers. The Qashqa'i have had little chance of ever hearing the Gospel of Jesus Christ. * Ask God to create a hunger in the hearts of the Qashqa'i and an openness to the Gospel of Jesus Christ. * Pray that God will provide contacts for missions agencies trying to reach the Qashqa'i. Pray that He will give them His strategy and wisdom. * In the midst of Iran's constant political unrest, pray that these nomads will begin to search for the true, lasting peace that only Jesus can give. * Pray that God will open doors for Christian businessmen from other countries to share the Gospel with the Qashqa'i. * Pray for Gospel messages to become available in audio format for this people group.View Qashqai, Kashkai in all countries. Location in Country: Southwest, mainly Fars Province; Bushehr, Esfahan, Chahar Mahall va Bakhtiari, and Hormozgan provinces; some possible in Kohgiluyeh va Buyer Ahmad Province; Shiraz, Gachsaran, and Firuzabad are centers.